The information below provides a summary (in alphabetical order) of the different leagues that Dartford Harriers compete in. For details of fixtures please refer to our calendar of future events. League Summary: The KYAL is part of the competition events provided by Kent County Athletics Association (KCAA) with an aim of providing competition experience for athletes who otherwise may not have the opportunity. The League is fully part of KCAA and is managed by the KYAL secretary who is a member of the KCAA Track and Field Committee. Age groups: U15 and U13 athletes. Team captain(s): Connor Burford and Rebecca Burford. League Summary: The Kent Fitness League is an enjoyable cross-country series for non-elite athletes (sub-34 10K men and sub-38 10K women are barred). Races are staged across Kent from October to March and the league has currently 18 clubs competing. Team captain(s): Stephanie Wood and Paul Dawes. League Summary: The Southern Athletics League is the area track and field league for clubs in the SEAA region who wish to compete in joint (male and female) teams. The league obtained a grant from UKA in 2011 and was sponsored by Sweatshop from 2012 to 2017. 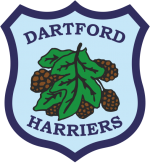 Dartford Harriers currently compete in Division 2 East of this league. Age groups: Senior, U20 and U17 athletes. Team captain(s): Women: Kim Taylor, Men: Doug Christie and Jason Marchant. League Summary: The Southern Counties Veterans Athletic League consists of clubs in six area divisions. The league is open to Masters athletes aged 35 and competitions are split across three age groups: 35 to 49, 50 to 59 and 60+. Age groups: Masters athletes aged 35 and over. League Summary: The YDL aims provide a premier, club based competitive pathway from young athletes to under 20. Offering a high quality competition accessible to athletes of all standards, and an opportunity to retain athletes in the sport to senior level. Dartford Harriers currently competes in the South – Central 2 Division of this league. Dartford Harriers currently competes in Division 2C of this league. Age groups: U20 and U17 athletes.